On Tuesday night, another trip east took the Liberty Girls Varsity Squad to face undefeated perennial D2 Power, Granville. 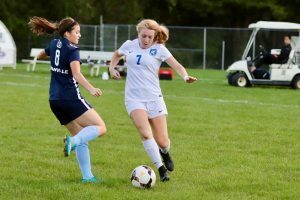 Over the last two matches, the Pattys had failed to find the back of the net and on the season have scored 11 goals in 9 matches, with five coming in one match vs. Newark. 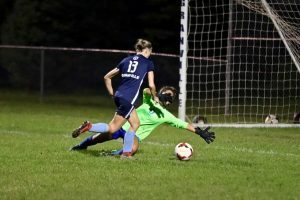 Liberty knew coming in that improving the attack would be needed to gain a positive result, as well as overcoming a recurring issue with slow starts. The improvement in generating scoring opportunities was evident from the start and for the balance of the match, with Liberty registering a season high 15 shots, and Granville generating the same. The Pattys missed taking an early 1-0 lead when a free kick from just outside the box by Quinn Casey (2′) was deflected by the Goalkeeper. A follow up attempt from point blank hit the post and then another deflected off the foot of a Blue Ace defender direct to the keeper. As luck would have it, Granville converted just three minutes later off a corner to take a 1-0 lead. The scoring flood gates then opened up as Granville outworked the Patriots for the balance of the first half and at the break the deficit had increased to 0-4. Maddie Kelley (Junior/GK) stops a 2nd half breakaway! The second half became a matter of pride and a challenge for the Pattys squad to decide if they wished to change the course of recent events and chart a better course for the balance of the season. What resulted was outstanding individual and collective efforts for the entire second half, and the quality of soccer improved dramatically. Even though the final scoreline was a disappointing 1-5, some answers were found that will hopefully carry the team forward. 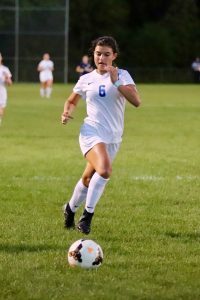 Liberty’s goal was scored by Rachel Davidson, her second of the campaign on an assist from Lyndsey Kijowski, but many others were involved in building and converting the opportunity. Another bright spot of the second half was a stellar 40 minutes of goalkeeping by Maddie Kelley, who subbed in and registered four saves including two top notch 1 v 1 stops on breakaways by the Aces. Next up Liberty faces Westerville South at home on Thursday at 7:15PM, JVA at 5:30PM in an OCC Buckeye match. JVA was idle on Tuesday and JVB raised their season record to an impressive 6-2-2 with a 2-0 win over Clear Fork. Goals were scored by Jordan Rich and Kelly Rothert. Sierra Kirby (GK) along with the entire defensive unit registered the shutout.